I know this general topic has been asked before, but if you were building a 16×20 shop would you get a 36 or a 52 inch table saw? Mine is one stall of a garage, about 15×25 I think. It would be really cramped with a 52”. I went with the 36 and while there have been times I wished for the extra width, I would notice not being able to walk around the saw 100% of the time. IMO it depends upon whether you plan to try to move everything out of the way so you use the space in other ways (such as a garage) when not in use. If that is not a factor, then as long as it has a mobile base on it you can always move it around or turn it a different direction way if needed so I would definitely go with a larger one. Smaller saws tend to be portable contractor saws designed to take to a jobsite and would not be my choice for a dedicated shop. Perhaps a better question is to compare the saws you a considering so we can help you decide between them? BTW, My shop is a 2-car garage but I have so much wood and other stuff stacked in there it is effectively a 1-car. My saw is 62” wide and it never feels cramped to me. If the saw is left tilt, you can usually rob capacity from the left side by sliding the rail farther to the right….meaning if you get the 36”, you could fairly easily extend to about 46” if necessary. Also depends if you think you will ever use that much capacity. If you’re only going to be ripping pieces less than 4’ wide, you can easily do it with a 36” fence. Originally, I had a 50” fence on 2 different table saws and i never opened them up that wide. It’s better to have it and not need it, than to need it and not have it! While 52 inch rip capacity is great for ripping 4’x8’ sheet goods, you will not have a large enough shop to handle the infeed and outfeed requirements of 4’x8’ stock. My Upper Peninsula “Workshop in the Woods” is a basic garage floor plan of 24’x28’ outside dimensions. I can just barely rip a 4’x8’ sheet of plywood, but it’s very close. Your shop will have a “center stage” area where a large machine will have to be moved into place and then again put back somewhere to make room for other equipment. If you are a big strong guy you can shove around 500 to 700 pound machines. For me…..no way! Keep in mind your electrical requirements. Big powerful machines need to be on 240 volt. You will need a 60 to 100 amp breaker box. Be sure to include on your list, a nice workbench with shoulder and tail vises. My workbench is indispensable. It is my gluing, clamping, and assembly station. I have a 52 and use it to cut down sheet stock pretty regularly. If you intend to do that with a separate track saw or that type of setup then the 36 will be more than enough. Wheeled unit if 52’’, mine is a 52’’ uni saw, and while i sometimes cut large stock with it, i usually pull it out of the two car garage and do the deed. as all the work tables in garage have projects on them, as does the dang patio. lol. seems i’m always clogging up the joint with stuff, (wifes words not mine). again depends on what aspect the saw will serve in your intended hobby. Having seen this question asked for many years on forums, the general consensus from those who haven’t had a 50”+ is to go with 50”+, whereas many, MANY not ALL, of those with the 50”+ would not do it again. It simply takes up too much room for how often it’s used. The key question is: will you be crosscutting 4’x8’ sheets of plywood frequently enough to justify the space required. If you’re going to be building lots and lots and lots of cabinets, then sure. 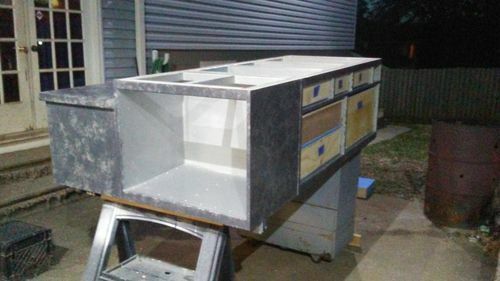 In fact, it that’s your intended use, you’re probably looking at building a full blown “workstation” of outfeed table and such. Knowing what I know, and how I work, I would not do it today. I’ve no interest in wrasslin’ full sheets of plywood onto the table saw (mine is 6” higher than normal). I’ll just use a circular saw to break the plywood down and finish on the tablesaw. If precision in the first cut is required (it hasn’t been yet), I’ll invest in a tracksaw. A 16 X 20 is a little small to accommodate that size of saw rails. You need walking around room. I, for one, hate jockeying 4×8 sheets of plywood over a table saw. When I shut down my cabinet business and shrank back to my garage shop, I set up my saw for a 36” wide max cut. For sheet goods I use a guided rail system like Festool which is as accurate as needed. And its much easier to plop a sheet of plywood on a couple of shop made sawhorses than trying to raise the ply and push over the saw. Especially with MDF. So I don’t think the extra 12” width is worth the space and cost when working in tight quarters where space is at a super premium. It s better to have it and not need it, than to need it and not have it! +1. My shop is just under 13’ 6” wide and I have a 52” right tilt saw and planning around the saw initially has proven to offer adequate space save for when my inner wood hoarder kicks in. I’ll reinforce what others have said – I think how you intend to use the saw, need vs. want, should drive the decision more than the space available. If you truly need 52 inches often, you’ll easily find a way to deal with the space issue, while happily enjoying the generous rip-capacity of your saw. If you truly need 52 inches often, you’ll curse yourself often for not getting 52 inches.